After finally finding a groove in my writing again, the whole thing was derailed by a string of migraines. Five days in a row. For those of you that suffer from them, you know these as “boomerang” migraines. They are increasingly intense headaches as your treatments aren’t getting rid of the migraine. They’re merely making it angry. Several people asked me if I could just sleep them off. I wish. 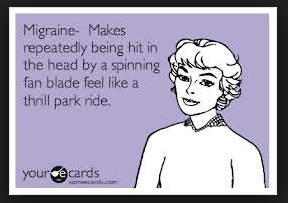 Migraines will wake you up and keep you rolled into a ball all night long not sleeping. They can also let you sleep, only to plow into you the moment you open your eyes. 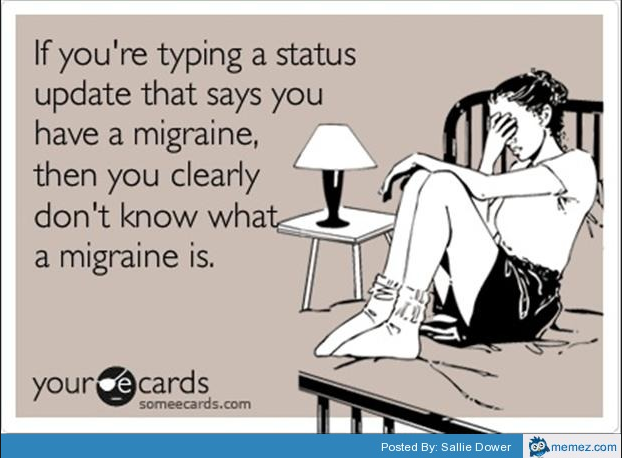 I’ve known people who get migraines because they haven’t slept and then can’t sleep because of the migraine. For me, they always start behind the same eye. I don’t get auras, but I do get pressure that means one is going to start. Time to take medicine or I will pay and pay dearly. Taking medicine at the first sign of an impending migraine usually heads it off, or at the very least, reduces the symptoms. This can be the difference from making it through the day with a headache and curling up in a ball because sound makes you vomit. 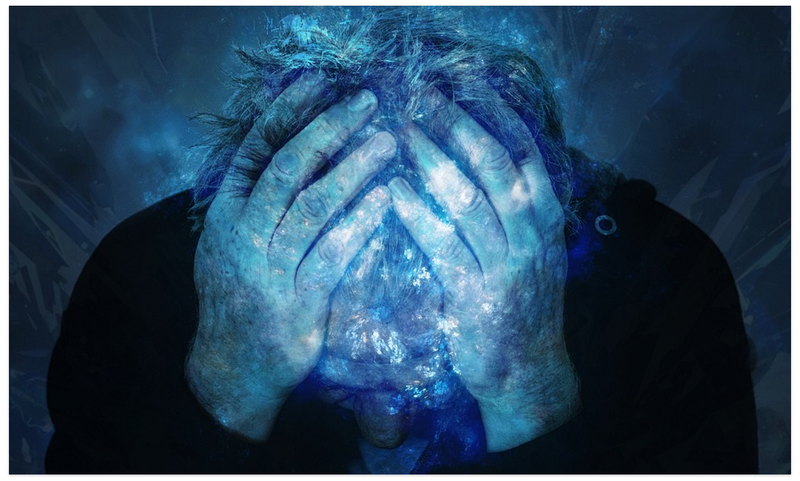 For the severity of the pain and the number of people migraines affect, we know very little. They tend to run in families (thanks mom! ), but don’t have to. We have yet to find a genetic marker. They may be hormonal. Adult women are 2-3 times more like to get them than men, but in pre-adolescence, boys are slightly more likely to get them than girls. Frequency and severity tends to reduce significantly for women after menopause. Pregnant women usually see a decrease in them, unless you’re unlucky. Then, even some of the best narcotics on the planet can’t end them, though they’ll make you care a lot less about the pain (migraine medicine passes through the placenta to the baby and narcotics don’t). They cause nausea, vomiting, and sensitivity to light, sound, and smell. Someone once equated it to a really bad acid trip. I have no idea if it’s true. It breaks my heart when pain shoots through my head just because my little ones are yelling my name in excitement when I come home from work. Not to mention, well, you know, pain bad enough to make you vomit. I do my best to keep them under control. It just doesn’t always work. I’m careful of personal migraine triggers. For me, diet soda is a huge one. I’ve cut anything with aspartame out of my diet completely. I’ve often wondered if migraines can be triggered by institutional lighting. I’m far more likely to get them at work than at home. I don’t think it’s the computer screen as I don’t get them from reading on my Kindle. Whatever the cause, this is not a modern problem. Migraines have been around for a long, long time. 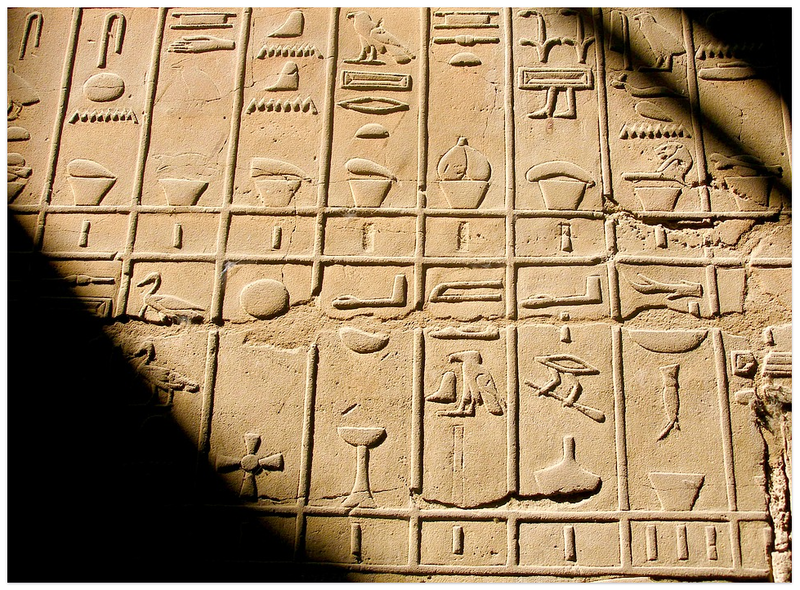 Earliest records we’ve found so far describing them are from Egypt around 1,500 BC. They are also widespread. Approximately one billion people suffer from migraines. Yeah, one billion. Most, though, don’t get them several times a month like I do. And even fewer get the ones that chain (where you get them successive days) or boomerang. With so many people affected, it’s an expensive problem. Twenty-seven billion euros in Europe per year, plus an additional $17 billion in the US. Despite all these sufferers, there is no cure for migraines. Just drugs to treat them. All I can say is thank goodness for the triptans. The aspirin, Tylenol, full-sugar coke cocktail I took in my youth has nothing on the triptans. Before the advent of these drugs, I could fight a migraine for days on end. Any amount of light felt like daggers being poked through my eyes, and sound made me vomit. It was awful. And while I forced myself to go to work or school, the pain could be crippling, and it most assuredly made it harder for me to learn and made me less productive. Migraines are sneaky, and if you don’t treat them, they can steal your life. Not in the here one moment and gone the next way, but drip by drip. Night after night spent home hiding from light and sound rather than participating in and enjoying life. I lost too much of my life to them. I’ve learned to fight back and fight back hard. They may have knocked me off track from writing for the moment, but I will prevail. This has been a particularly nasty bout, but I haven’t let them win before and I won’t now. How about you? Ever suffer from migraines? Maybe other headaches or recurring pain? How did/do you deal with it? Do you find it makes you less productive or enjoy life less? What do you do to push through it? I’ve suffered since childhood. They became chronic 10 years ago. It’s been draining. Finally I have them under a reasonable amount of control with preventatives, blockers, diet & lifestyle changes. But nothing beats a dark, quiet room and my bed. Never suffered them, to my knowledge (knock on wood). I feel I must confess, some of your descriptions of your incapacitating pain helps me write about my characters’ pains. Sorry to benefit from your suffering. I’m a writer. Hope you return to the writing track soon. You’d know if you had. Consider yourself lucky! Glad to help, even if I hope to never suffer another. I’ve only had a full-blown migraine a few times in my life. One I had back when I was a youngster was so bad that Bea (“Pseudo-mom”) thought I had meningitis: fever and everything. (Didn’t take me to see a doctor, though. Or keep me home from school for those three days.) On the other hand, my twin used to have migraines a lot, at least two or three in any given month. He gets the kind that starts with pressure on the ophthalmic nerve; this kind of headache is apparently more common for men than for women. Moving away from a part of the country that’s especially bad for suffers of sinus headaches, etc., has helped him a lot. Interesting that your twin gets them but not you. Yes, and I totally agree! If my knees hurt, I can pop some Advil and still read or write. Sadly, this gets in my way too. I hope you’re feeling better. Thanks, yes. A call to my doctor and some meds have helped a lot. The euphoria of going from being in severe pain to no pain… Better than chocolate. I can empathize. I, too, suffer from migraines.